South Bend Lathe Works was founded in 1906 by the O'Brien twin brothers after they graduated from Purdue University in Indiana. Within just a quarter of a century, South Bend Lathe Works became the largest manufacturer of precision metalworking lathes in the world with customers in more than 88 countries, and machines which were used in every type of industry including schools, home workshops and large manufacturers. A couple of very famous customers included Thomas Edison and Henry Ford. Our largest customers are the US Navy and Army as well as many departments of our Government. 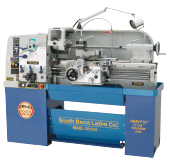 The passion which the O'Brien brothers had when they founded South Bend Lathes continues today and we are proud to boast that we have the largest selection of premium quality manual lathes in the world. Utilizing Meehanite bed castings, Allen Bradley controls, German and Japanese precision made bearings, we make sure that no aspect of the quality is compromised. Read the full history of South Bend Lathes . If it has the South Bend name on it, you will be proud to own it!